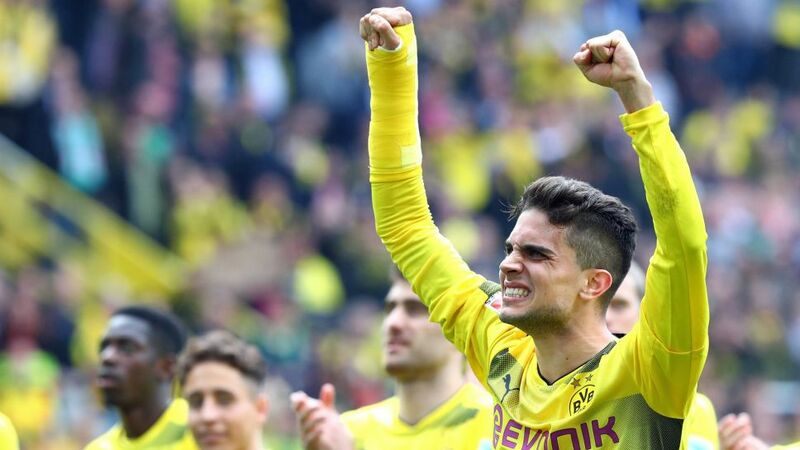 Having battled through the Barcelona ranks and even beaten a potentially deadly bomb attack, Borussia Dortmund's Marc Bartra has hurdled every obstacle put in his path to become one of the Bundesliga's most accomplished and stylish defenders. Catalan by birth, Bartra's first contest was against all the other aspiring youngsters hoping to make it big at the region's proudest monument: FC Barcelona. Initially on the books of the Blaugrana's neighbours Espanyol, he was drafted into the famed La Masia academy — the production line that shaped Xavi Hernandez, Andres Iniesta and Lionel Messi, among many others — in 2002 aged just 11. It was there he was given a first and stark picture of the Himalayan challenge ahead of him when his fraternal twin, Eric, was one of a group of youngsters told their dream of playing in front of a packed Camp Nou was over. Marc was kept on, his talent speaking louder than his voice. "He's a very humble boy, a good guy and a worker. As a kid, he was a little shy, but I would like to highlight above all his good character," said Sergio Lobera, Bartra's first coach at Barcelona. Lobera must, however, have seen the steely edge to the well-rounded personality and healthy dose of talent that propelled the youngster through the ranks, rising to the top of the creme de la creme Catalan. "I was on an upwards ascent until Luis Enrique arrived," said Bartra, who found the likes of Jeremy Mathieu and Thomas Vermaelen preferred to him in central defence. "I started well with him, but later I stopped counting. It was a tough 18 months for me." Being drafted into the first team squad in 2010 by Pep Guardiola was a major step, but his route to a regular place in the starting XI remained a distant ambition with club icons Carles Puyol and Gerard Pique firmly barring the way, and that was even before Javier Mascherano joined. That heavyweight trio meant Bartra's role was little more than a cameo under Guardiola and his successor, Tito Vilanova. Given Barcelona's emphasis on promoting homegrown talent both on the pitch and in the dug-out, it is ironic Bartra's best season — the 2013/14 campaign in which he made 30 appearances and broke into the Spain team — came under an 'outsider,' Gerard 'Tata' Martino. Even then, his battle for recognition at Barça continued under a coach who knew him well, his former reserve team boss Luis Enrique. It marked yet another challenge for the then-25 year old, who had known nothing other than his local region and club, and who — though having amassed a blinding array of silverware that included five La Liga titles and two UEFA Champions Leagues — had much to prove. He started to do that in 18 Bundesliga games for Dortmund before he was left with a broken bone in his right arm after the shocking attack on the team coach ahead of BVB's UEFA Champions League quarter-final first leg with Monaco in April. "When the attack happened, I thought I'd never play again. In the first five, ten minutes, I couldn't move, I couldn't hear anything," revealed Bartra, who required surgery on the fracture and to remove broken glass. *The 2nd option. I returned to play football after hitting rock bottom.. That is the biggest title I could win and I win it every day I put my boots on. "When the doctor told me after the operation that everything would be fine and that I would be able to play again in a month, it was incredible and the very best news. I now feel stronger today than I did before." More than the physical strength required to overcome his injury, the mental fortitude Bartra showed was incredible, and sheer willpower accelerated what was a glorious and emotional return to the pitch. "Playing football again after hitting rock bottom," replied Bartra when asked by a Twitter follower about the top achievement of his career so far. "It's the greatest triumph I can have and I achieve it every day I put my boots on." He featured in the Matchday 34 win over Werder Bremen that secured Dortmund's place in the Champions League group stage, and even played all but the last 14 minutes at Berlin's Olympiastadion to help BVB lift the DFB Cup at Eintracht Frankfurt's expense. "After making my comeback I told my wife it was the happiest moment of my professional life. It was unbelievable," he told former Bremen, Dortmund and Germany defender Patrick Owomoyela in an exclusive interview as part of the 'Owo meets…' series. "I've experienced a lot of great moments, but that was unbelievable." Quiz: Been paying close attention to the Marc Bartra story? Prove it!